What is: The Wednesday Report? Canadian Participation: Ballistic Missile Defence Should Canada Join The U.S. In Iraq? The Wednesday Report (TWR), Canada's Aerospace and Defence Weekly, was first published as a specialized military industrial intelligence periodical on June 10, 1987. 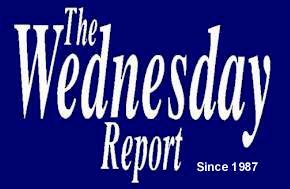 The Wednesday Report (TWR) was then owned by Maclean Hunter Limited, Business Publications Division. The founding publisher was Micheal O'Brien who was at the time, publisher of Aerospace & Defence Technology, Aerospace Canada, The Aerospace Industries Association of Canada's (AIAC) Capability Guide and The Canadian Young Astronaut. Circulated to paid-up subscribers in government, industry, military and academia in NATO and United Nations countries around the world the initial cost of a one year subscription was $500.00. In 1989 the publication along with similar properties was acquired by MPRM Group Limited. In addition to the Uniform Resource Locator you used to arrive here, The Wednesday Report is also named and indexed within the Handle System established by the Corporation for National Research Initiatives (CNRI) in concert with the Defense Advanced Research Project Agency (DARPA). MPRM Group Limited operates a secure Handle Server at hdl:1720 You must have the Handle System Resolver (browser plugin) installed on your computer. Get it here. Copyright 1986 - 2004 MPRM Group Limited. All rights reserved. Revised:May 20, 2004.